What is that in my grove, Horseweed or Hairy Fleabane? Photo 2. 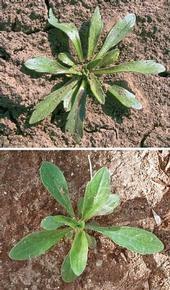 (Right) Seedlings of hairy fleabane (top) and, horseweed (bottom). (Photo: Shrestha et al. 2008).